When Bryan Campbell and Gregor Halenda got in touch to let us know that they were planning an expedition through the Yukon and Alaska, we knew it was a trip that we’d want to support. On their return, we had a chat with Bryan to hear about his time on the road and how the Eversholt Jacket fared. Could you give us an outline of where you went? We were actually supposed to set out from Seattle, Washington the same day we all flew into town and then head straight to Vancouver. That way the first leg of the trip wouldn’t be so intense. But, as it turned out, a forgotten passport delayed our trip and to get back on schedule we skipped Vancouver and went directly to Prince George, B.C. Completing around 566 miles in the first day. We then made our way to Stewart, B.C and up to Watson Lake, Yukon Territory - which may have been the most beautiful part of the ride. The skies were clear and blue; we were on the same winding road for over 400 miles and ended the day cooking steaks over a campfire. It was idyllic. From there we went to White Horse, then crossed the border to Tok, Alaska. On our way to Denali National Park we rode the Denali Highway which is 130 miles in total but only about 10 or so miles of it are actually paved - a true test for the bikes. From there we headed south and finished in Anchorage, Alaska. When all was said and done we, covered 2,675 miles over seven days. What gave you the idea for this trip? The idea for this trip actually started life as something completely different. I wanted to do a ride from Ho Chi Minh City to Hanoi but with the direction we took for Gear Patrol Issue Five, my editor told me to reign it in and do a similar ride but "more local". I took that as "same continent" and proposed Seattle to Anchorage, which is pretty epic as far as runner-up ideas go. What bikes were you riding? We took the Triumph Street Scrambler (equipped with off-road tires) and a Ducati Desert Sled. 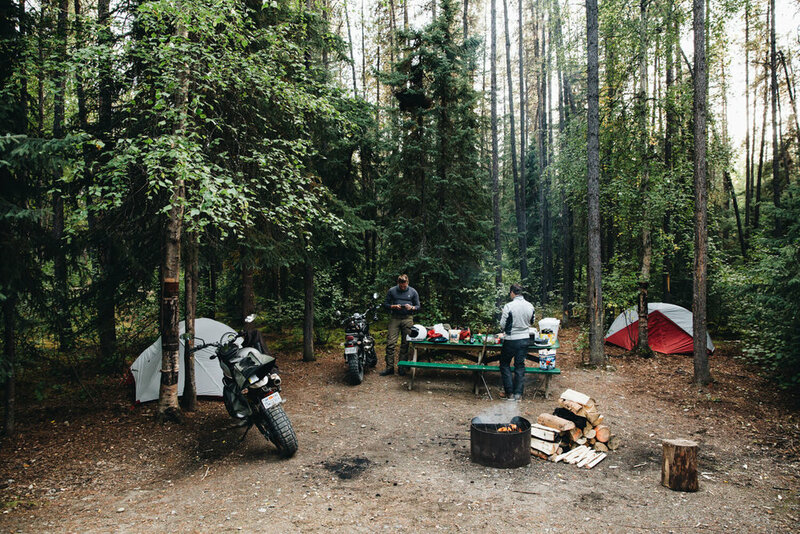 I wanted to prove that bikes as analog as today’s scramblers are just as capable of completing an expedition as big adventure bikes. In a way, scramblers are, after all, the original adventure bikes. What was the standout memory from the trip? When we were riding past Destruction Bay at Kluane Lake, between White Horse and Tok, the sky was a bright cyan blue, there was a gigantic mountain looming over the lake and while we rode, fog rolled in and settled out in the middle of the water. As soon as we stopped I spotted a track just down off the road and immediately pointed the Triumph towards it. From there, I found my way on to the beach and before long we were racing up and down, blasting along the shoreline, sand and water going everywhere, and generally just having the best time. It was a much needed break from the miles of asphalt. How did you balance covering distance vs getting amongst it off-road? It’s really not hard to find off-road bits up there. Between Destruction Bay, the Denali Highway and sections of the Alaska highway, the dirt sections were along the way. So it was sort of convenient. That’s not to say we saw all the dirt there is to see up there. If anything the routes we followed would probably be considered “light off-roading” compared to the trails and tracks peppered throughout Canada and Alaska - and still we had a rough time of it. What was the one thing you wish you'd brought with you & the one thing you couldn't do without? I wish I had brought thicker gloves as a backups. During the day it was fine, but as soon as the sun set temperatures plummeted. Going off that, I’ll actually say there’s two things I couldn’t have gone without and they were my merino neck gaiter and the wool collar of my Eversholt jacket. The combo trapped my breath and basically gave me a poor-man’s heated jacket. Though, after 2,675 miles on the road, heavy breathing, bug spray and one or two mornings where I skipped brushing, they were in need of airing-out. What was the biggest hurdle that you had to overcome?The biggest hurdle we faced was actually in the last couple hundred miles. Looking at the weather before the trip it was supposed to be clear, beautiful and decently warm the entire way. But heading into Anchorage we hit a massive rain storm where temperatures dropped and basically gave us a -25°F wind chill. Not having the proper gear for that type of extreme weather was tough. Did you come away feeling that you'd learnt something from this trip? Yes. Looking at a 2,675-mile route on a map versus riding every inch of it is like flying over an ocean versus crossing it in a row boat. When you’re feeling every bump and the wind is in your face for hours at a time as you pass through a ridiculously varied landscape, you get a better sense of scale and the grandeur of a region like that. Are there any places that you would like to go back to? 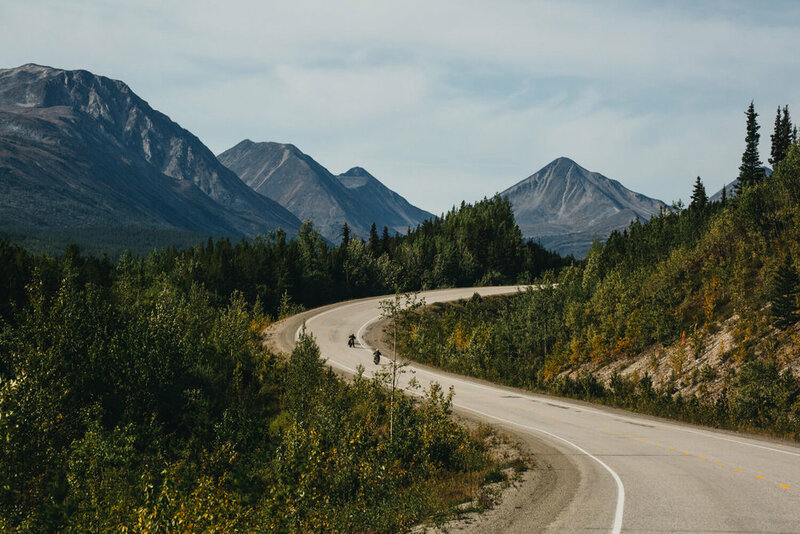 You could ride the Denali Highway over and over. Any tips for someone about to set off? On a trip like this, when choosing your equipment, if you utter or even think the phrase "I’m sure I’ll be fine", know that you’re lying to yourself. When I looked at the weather and only packed the gloves I did, I said "I’m sure I’ll be fine". My fingers nearly froze heading to Anchorage. When it came to buying the spare gas cans we debated the size and number to get. Had we gone for the smaller ones and said "we’ll be fine'" we would have been stranded 150 miles from the nearest fuel stop, two or three times. Luckily, we went with the bigger jerrycans. I’d like to get that Vietnam ride in the books. But if I’m forced to stay "local", I’ve had my eye on the riding down Continental Divide for a while. To see more details on the Eversholt Jacket that was worn on this expedition, follow the link below.